The West Greeley Conservation District is working to build more community awareness and local partnerships. We are active Greeley and the Evans Area Chambers of Commerce members and participating on Greeley’s Agriculture Committee. We are partnering with The City of Greeley to stimulate more interest in urban conservation best practices. We thank the City for airing our WGCD Video on their Cable Channel all during National Ag Week, March 19-25. We produced the 10 minute program for our November 2016 annual meeting to give an easy-to-understand overview of what a wonderful resource YOUR Conservation District can be for you. You can view it in the banner/header of our Web Site at www.wgcd.org if you would like to watch it. 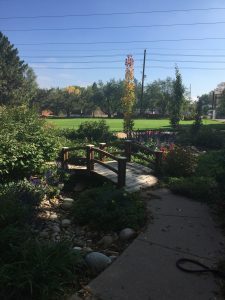 The West Greeley Conservation District is participating as a sponsor to assist with the self-guided Greeley Garden Tour – featuring six local gardens you can tour on Saturday, June 24. Look for our quarter-page color ad featuring a photo of the beautiful George M. Houston Gardens in their Tour Booklet, which also serves as your $15 ticket for this year’s tour. Tickets go on sale mid-May. The Greeley Garden tour started featuring lovely and unique Greeley gardens in 1993. Houston Gardens was on the tour last year. The proceeds from the tour will benefit the Poudre Learning Center (PLC) to enhance the science and environmental learning in the natural setting they host in west Greeley. The PLC annually welcomes 30,000 children and adults to experience nature, often for the first time, through their programs. As a result, many go on to seek additional education in the fields of science or natural resources.